Explore Your Archive is an Archives and Records Association (ARA) initiative, which aims to connect more people with their local archives service. Each November Archives services across the British Isles are invited to join in by hosting their own special events. At Manx National Heritage Library and Archives, we are always been keen to participate. This year the library team used the Centenary of the Great War as a theme and developed a series of informal reminiscence sessions – which took place in the pub! We held sessions at two pubs across the Island and also at the Manx National Heritage Library and Archives between 6- 10 November 2018. 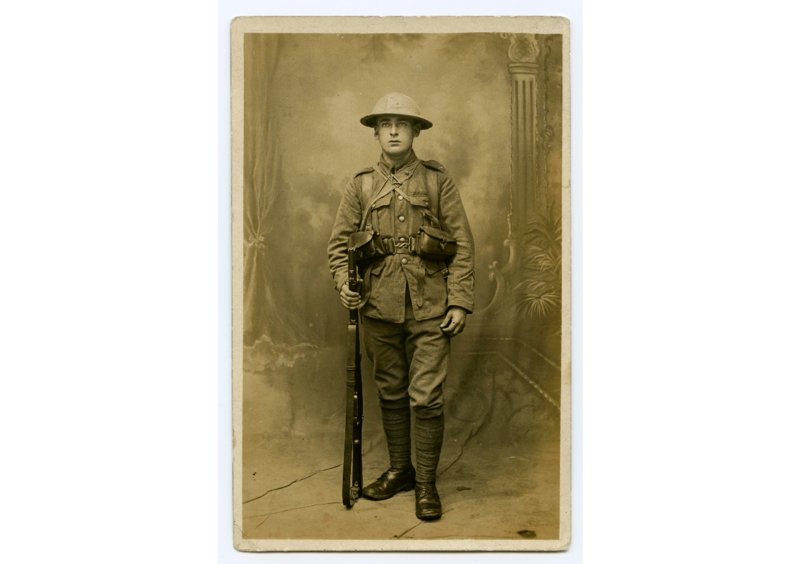 Matthew McCauley, who was born in Douglas, killed aged 19 during the Third Battle of Ypres in the autumn of 1917. 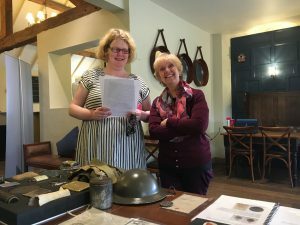 The Library team visited pubs equipped with facsimiles and transcriptions of World War One diaries, letters, newspaper articles and photos from our extensive library and archives collections. We also took along a Museum object handling box, full of replica World War One items. These were used to invite people to discuss and share memories and stories and to discover more about the Manx people involved in the Great War conflicts. The Highwayman in Peel proved to be a very cosy venue. Our lunchtime event was held at The Highwayman in Peel on 6 November. 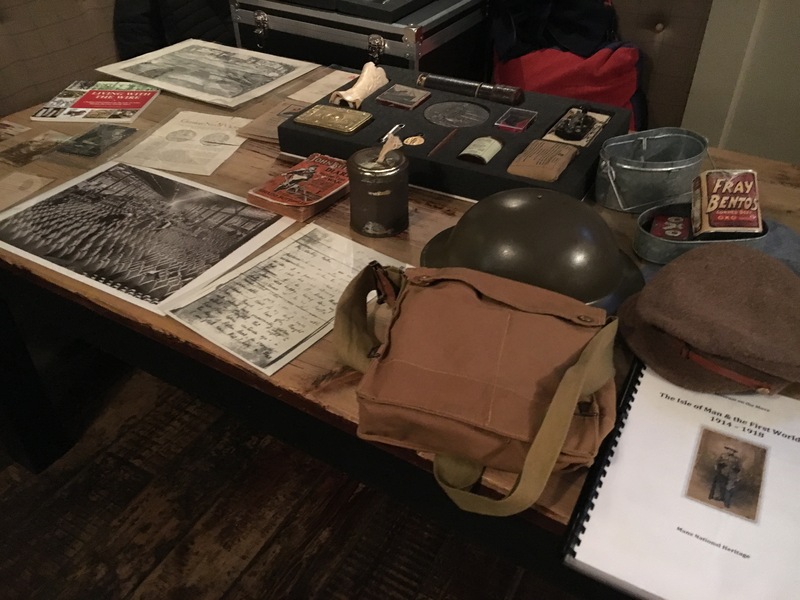 It was very cosy atmosphere and people came ready to chat about their own family members who had been involved in World War One. 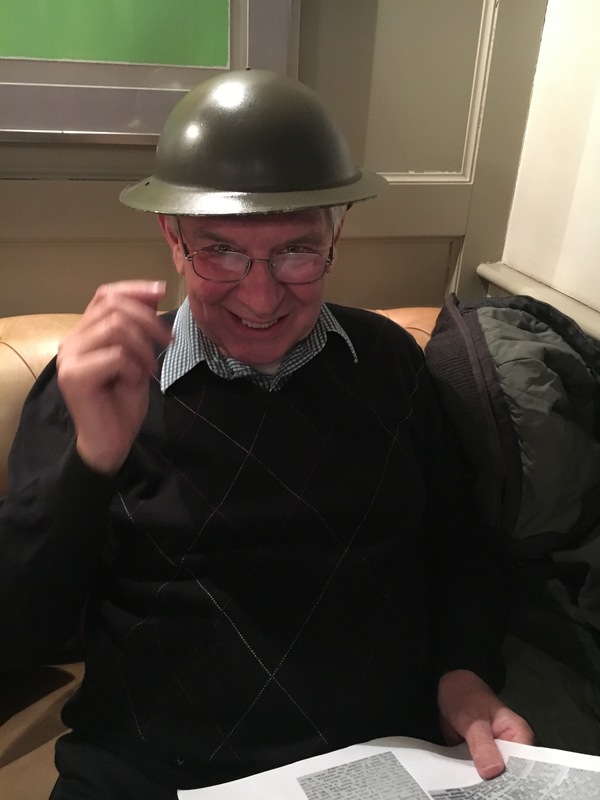 Some even tried on the replica World War One helmet which we had brought with us. This smaller gathering allowed for a very intimate discussion and when the Last Post was played, it left many people with a tear in their eye, as they looked at the photographs of Manx Tommies. We even read some of the letters from the Front out loud, which was also very emotional. Tony Temple, who attended our event at The British, loved the replica helmet! Our evening get-together was held at The British public house in Douglas on November 8th. We played some war-time music, which was very atmospheric. A veteran from World War Two attended this session and was able to talk in great detail about his time in battle. People had brought along their own family photos to show around also, which was a super way of sharing personal stories. The pub certainly was a lively place and promoted lively discussion, which was both engaging and thought provoking. Some of the replica items from our World War One handling collection. Our weekend session was enjoyed in the Reading Room of the Manx Heritage Library and a particularly touching addition was the World War One medals and memorabilia bought in by two colleagues. As Librarian at Manx National Heritage and as one of the facilitators of the events, I found the pubs a wonderful way to outreach to people and showcase our collections. It really did bring heritage to life. We hope that you enjoyed Explore Your Archive 2018 as much as we did! – Suzi Heslan, Librarian, Manx National Heritage.